The Cartier Roadster is a timeless dress watch, defined by is its barrel-shaped case. It's available with a mechanical or quartz caliber and as a men's or women's watch. Features like gold cases and diamond-studded bezels increase its value. 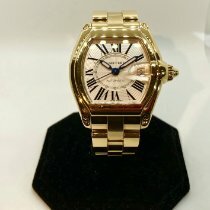 Cartier first introduced the Roadster in 2001, making it one of the company's youngest watch series. For comparison, they have been producing models like the Santos since 1904 and the Tank since 1917. The Roadster is now only available as a pre-owned watch since Cartier stopped producing it in 2012, much to the disappointment of many fans. Like its older sister models, the Roadster is a dress watch that goes perfectly with a suit and tie. Dress watches are suitable for both formal and festive occasions such as the opera, business meetings, and receptions. However, the Roadster pairs just as nicely with a tux as it does with a T-shirt. Cartier made the Roadster in several sizes. The most popular men's model is 43x38 mm. Women's watches are usually 36x30 mm. As for materials, the Roadster comes with the choice of a stainless steel or yellow, white, or pink gold case. Most watches feature an ETA-based automatic movement, though there are also models available with quartz movements. The Roadster is water resistant to 100 m (10 bar, 328 ft), making it a suitable everyday watch. 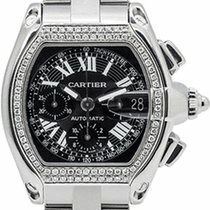 How much does a Cartier Roadster cost? Are you looking for a dress watch with a barrel-shaped (tonneau) case? Cartier's Roadster has prestige and an elegant design that is typical of this manufacturer. The Roadster is only available as a pre-owned timepiece since Cartier ceased its production in 2012. However, most watches are in good to very good condition. Smaller stainless steel models with three hands and a quartz movement represent the entry point into this collection. Their sizes make them a great option for women . Plan to spend between 1,900 and 2,100 USD for a timepiece in very good condition. Women's watches with automatic movements cost about 230 USD more. Prices for men's Roadster models begin around 2,600 USD. This will get you a classic three-hand watch in stainless steel or the rather sporty Roadster S. Cartier coated the bezel of the Roadster S with a layer of extra scratch-resistant black ADLC . The timepiece also comes without a Cyclops lens. A black rubber strap keeps this watch safely on your wrist. Models with gold cases require a much larger investment, with prices starting in the 5,000 to 6,000 USD range. Timepieces featuring diamonds occupy the top of the price range. Women's watches with diamond-studded bezels typically sell for between 11,700 and 17,600 USD. Rare Roadsters, such as pink gold men's watches with 40x55-mm cases, often cost over 23,400 USD. The Roadster XL GMT is the perfect companion for frequent travelers. It displays the time in a second time zone using an additional central hand and a 24-hour scale around the dial's edge. This stainless steel watch measures 49x43 mm and costs anywhere from 4,100 to 5,900 USD in good condition. The version with a chronograph adds a sporty touch to the Roadster collection. It has a tri-compax layout: The minute counter is at 6, the hour counter at 9, and the small seconds and date display are at 3 o'clock. Expect to pay around 3,400 to 5,300 USD for the stainless steel edition. The bicolor gold and stainless steel version costs an additional 1,200 USD. When diamonds are thrown into the mix, prices up to 23,400 USD are not uncommon. The Roadster has the eponymous sports cars from the 1950s and 60s to thank for its name and design. The curved lines of its barrel-shaped case resemble those of an aerodynamic roadster. Sunken screws on the lugs look like the headlights of classic cars such as the Alpha Romeo Spider and the Aston Martin Racing. Even the crown's design was inspired by classic cars, namely by the fins found on classic Cadillacs. This look is only enhanced by the seamless transition between the raised portion of the case, the crown, and the Cyclops lens on the sapphire glass. 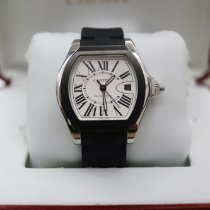 Cartier outfitted some Roadster dials with their characteristic Roman numerals and others with Arabic numerals. The latter dial design is known among fans as the roulette or Las Vegas dial and is meant to resemble the speedometer of the Porsche 356 Speedster. This dial only appears on three-hand models, while the chronograph versions only feature dials with Roman numerals. However, this has no effect on the sportiness of the chronograph models, as their subdials at 3, 6, and 9 o'clock are like small versions of the roulette dial. The Roadster series is made up of more than just watches: Perfume, eau de toilette, and elegant pens can also be found under the Roadster name. Cartier offer an entire collection of luxury goods. Louis-François Cartier founded the company in 1847 when he took over his teacher's jewelry workshop. His grandsons made the family name famous worldwide. At the turn of the 20th century, Cartier was supplying European nobility with its jewelry. In 1904, the Santos became the first men's wristwatch produced by the company. Cartier now belong to the Richemont Group (along with Baume & Mercier, Dunhill, IWC, Montblanc, and others). 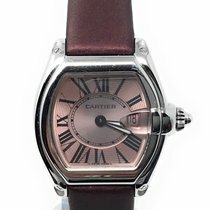 Aside from watches and jewelry, Cartier also offer leather goods, glasses, pens, and other luxury goods. Even today, Cartier still serve nobility: Kate Middleton, the Duchess of Cambridge, wears a Cartier Ballon Bleu.